The defending champions are still without a point after three games this season. 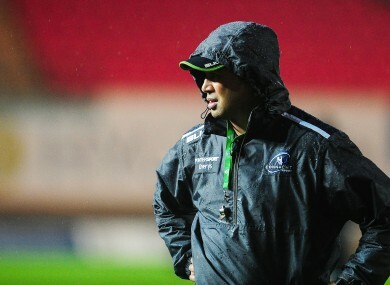 PAT LAM HAS brushed off talk of a crisis at Connacht despite sitting bottom of the Pro12 after three matches. The reigning champions’ dramatic turn of fortunes sees them below perennial strugglers Zebre and Benneton Treviso after failing to pick up a single point so far. Connacht’s latest defeat away to the Scarlets, who had themselves begun the new campaign with a trio of losses, has raised serious questions about their ability to back-up last season’s stunning title win. But Lam insists there is no need to press the panic button, with home games against Edinburgh and Ulster to come before they embark on their first European Rugby Champions Cup campaign. Lam said: “I’m not concerned if people talk about a crisis. I wasn’t concerned when people said we were great last season. I have a good saying off a mentor I work with, ‘I have no business doing what I do if I listen to people who have no idea or experience about what I do’. “The only way we are going to improve is by keeping working on the things we can do, not beating ourselves up about what’s happened or wishing we’d like to be somewhere else. Connacht led 8-7 going into the final quarter against the Scarlets after a first-half score from wing Niyi Adeolokun but a try from Wales international Liam Williams on 65 minutes, his second of the match, proved to be the difference between the two sides. It prevented the Scarlets from losing four consecutive home fixtures for the first time since the Welsh region moved to Parc y Scarlets in 2008. Email “'If I start listening to people then I'll lose focus on the job': Lam brushes off talk of Connacht crisis”. Feedback on “'If I start listening to people then I'll lose focus on the job': Lam brushes off talk of Connacht crisis”.